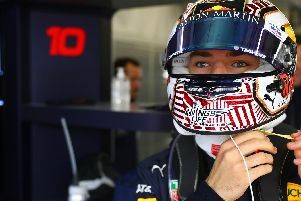 Daniel Ricciardo made it three podiums in a row for Red Bull Racing in Belgium on Sunday as Max Verstappen failed to convert a front row start into points. Ricciardo, who finished third in Hungary and second in Germany, crossed the line second again at the Belgian Grand Prix behind race winner Nico Rosberg. A dramatic start helped Ricciardo through the field, but hampered his Red Bull Racing team mate Verstappen, who was starting from the front row. Slow off the line, the Dutchman was involved in a collision with both Ferraris and needed a first lap pit-stop to repair a damaged front wing. Battling through the field, Verstappen renewed his rivalry with Kimi Raikkonen, who has openly criticised the teenager’s driving style in the past, and the pair clipped on several occasions as they battled down the order. Ricciardo meanwhile saw off Force India’s Nico Hulkenberg to move into second. A potential battle with championship leader Lewis Hamilton looked set to unfold until the Mercedes driver pitted late on, handing Ricciardo a safe second place. Verstappen’s tyre problems saw him eventually finish 11th, out of the points.